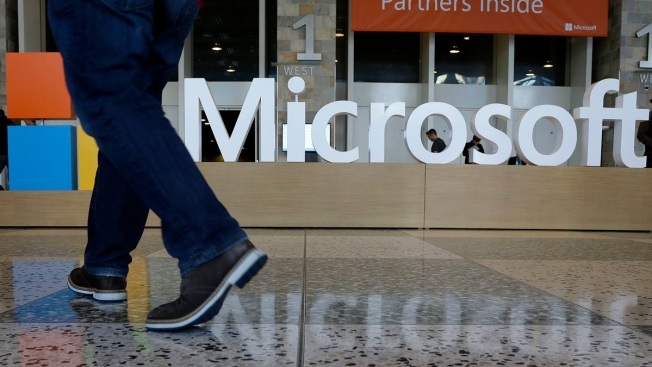 In this April 28, 2015, file photo, a man walks past a Microsoft sign set up for the Microsoft BUILD conference at Moscone Center in San Francisco. Microsoft has uncovered new hacking attempts by Russia targeting U.S. political groups ahead of the midterm elections. The company said Tuesday, Aug. 21, 2018, that a group tied to the Russian government created fake websites that appeared to spoof two American conservative organizations: the Hudson Institute and the International Republican Institute. Three other fake sites were designed to look as if they belonged to the U.S. Senate. The Trump administration added to its growing list of sanctions against Russia on Tuesday as U.S. lawmakers urged tighter economic restrictions on Moscow and Britain's top diplomat accused Russia's leader of pursuing policies that are making the world more dangerous. The Treasury Department announced two new actions against Russian targets: blacklisting two companies and two individuals suspected of trying to circumvent U.S. sanctions imposed in June in response to cyberattacks; and against two Russian shipping companies suspected of transferring petroleum products to North Korean vessels in violation of U.N. Security Council resolutions. While President Donald Trump has sought closer ties with Russian President Vladimir Putin, his administration has intensified economic pressure on Moscow over what it describes as "malign Russian activity" in Ukraine and Syria and Russia's attempts to disrupt western democracies. Two senior officials from the State and Treasury departments told a Senate hearing Tuesday that since January 2017, 217 Russian business people, officials, and private and state-run companies, including 14 banks and 20 energy firms, have been sanctioned. In addition, they recalled that the administration had expelled 60 Russian spies and closed Russia's consulates in San Francisco and Seattle. 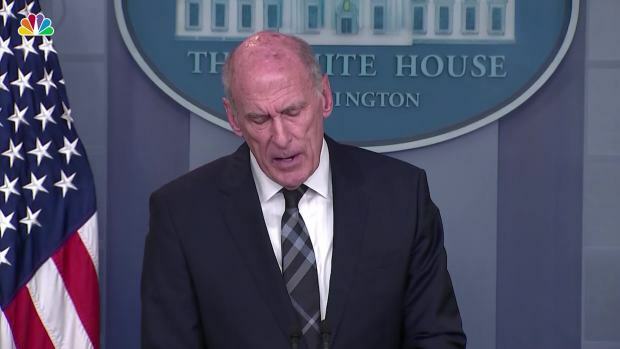 National Security Adviser John Bolton, Homeland security chief Kirstjen Nielsen, Director of National Intelligence Dan Coats, and FBI Director Christopher Wray discuss the security of the upcoming elections and how Russians continue to meddle. Marshall Billingslea, the Treasury Department's top terrorist financing official, acknowledged that the threat from Russia was "significant and continuing" but told the Senate Foreign Relations Committee that without the sanctions "their behavior would be even further off the charts." He and the State Department's top diplomat for Europe, Wess Mitchell, said Russia is feeling the impact, costing its economy tens of billions of dollars, with companies under sanctions losing a quarter of their operating revenue and having to shed employees. But the officials faced questions from skeptical lawmakers about the administration's policy toward Russia, particularly since Trump has sent conflicting messages about it. The committee's chairman, Sen. Bob Corker, R-Tenn., called Trump's comments "undisciplined" and Democratic Sen. Jeanne Shaheen of New Hampshire lamented that the president had issued "contradictory" statements about Russia. "Until we see a change in that behavior we are going to continue to see and have concern." Sen. Chris Murphy, D-Conn., said it appeared to him as though the administration were pursuing two different policies: one of the president's and one of federal national security agencies. Mitchell denied that. "This is the president's administration, this is his foreign policy." Although Trump himself has repeatedly cast doubt on Russia's culpability in 2016 election meddling, Mitchell and Billingslea both pointed to the Kremlin and Putin as the source. "Putin wants to break apart the American republic, not by influencing an election or two, but by systematically inflaming the perceived fault-lines that exist within our society," Mitchell said. "His is a strategy of chaos for strategic effect. Accepting this fact is absolutely essential for developing a long-term comprehensive response to the problem. The most dangerous thing we could do is to politicize the challenge, which in itself would be a gift to Putin." Russia denies accusations of election meddling, but suspicions of interference deepened Tuesday when Microsoft said it had uncovered new Russian hacking efforts targeting U.S. political groups before November's midterm elections. Russian officials dismissed the company's claims as unfounded. Microsoft said that a group tied to the Russian government created fake websites that appeared to spoof two American conservative organizations: the Hudson Institute and the International Republican Institute. Three other fake sites were designed to look as if they belonged to the U.S. Senate. Meanwhile Britain's foreign secretary, Jeremy Hunt, called on the European Union to ensure that its sanctions against Russia were comprehensive, in response to accusations Moscow poisoned a former Russian spy in Britain, using a nerve agent. He said the EU and United States should respond to Russia with "one voice." "Of course we must engage with Moscow, but we must also be blunt," Hunt said in a speech in Washington. "Russia's foreign policy under President Putin has made the world a more dangerous place." The U.S. sanctions announced Tuesday targeted two companies and people suspected of trying to circumvent existing sanctions against Divetechnoservices of St. Petersburg. That company was sanctioned in June for procuring underwater equipment and diving systems for Russian government agencies, including the Federal Security Service, formerly Russia's KGB spy service. The U.S. alleges that Marina Igorevna Tsareva, an import manager for Divetechnoservices, attempted to help the company circumvent U.S. sanctions through Vela-Marine Limited of St. Petersburg. Treasury said another employee, Anton Aleksandrovich Nagibin, also helped Divetechnoservices circumvent U.S. sanctions. The two companies targeted in Tuesday's action were Vela-Marine and Lacno S.R.O., which is based in Slovakia. The sanctions freeze any assets they may have in U.S. jurisdictions and bar Americans from doing business with them. Separately, Treasury targeted Primorye Maritime Logistics Co. and Gudzon Shipping Co., based in the city of Vladivostok, and six of their vessels. The department said that earlier this year, one vessel linked to the Russian companies transferred 3,500 tons of oil to ships flying the North Korea flag. Associated Press writers Susannah George and Deb Riechmann contributed to this report.